Order loop cards for the ZXSe panel separately. Please scroll down to see options below. The ZXSe range of analogue addressable fire alarm control panels have been designed and constructed around proven and reliable microprocessor technology. 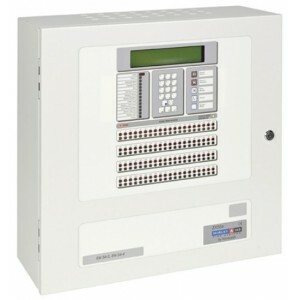 This simple approach has produced a modular, scalable fire alarm platform suitable for protecting all types of premises. Supporting a total of five industry leading protocols, Apollo, Hochiki ESP, Nittan, Morley-IAS and System Sensor, allows fire detection devices to be independently selected based on performance or aesthetic appeal. The ZXSe range of intelligent fire alarm control panels has been designed to assist with the normal operation of a fire detection system. Standard weekly testing is available through a simple menu structure allowing selection of the zones to be tested either with or without activation of the output relays or sounders. Additionally, the status of individual devices can be analysed to determine whether cleaning or replacement is required. As the installation grows the ZXSe panel can expand with the building or site by adding additional devices, loop cards, printers, or repeater panels. Additionally, further ZXSe panels can be networked together allowing an even bigger system to be created.